I am a child of my age, and as such, I have always looked at authority as something to be handled cynically and derisively. I recognize that certain authority, such as law enforcement needs to be obeyed if only to keep us all from crashing our cars into one another. Much beyond that, any authority, be it parental, church, political or otherwise was held to a “prove it” standard. And not just prove it to someone who would approve those in positions of authority, but prove it to me, the person you would have authority over. Honestly, it’s hard for me to think of anyone whose instructions or thinking I would follow simply because they were “the authority”. Question everything and everyone has been my MO. Fear of or respect for authority were punch lines in my book, certainly not anything by which I would make decisions. I would guess that a lot of people are like me in this regard. However, I recently realized something which has made me re-examine my attitude towards authority. You see, over the last 10-15 years, I have invested a lot of time and mental energy into constructing what you could call a philosophy of life. It’s my understanding of the nature of life, the rules by which we ought to govern ourselves in order to live happy, productive lives which are a benefit to our families and communities. I can provide detailed, well reasoned and thought-out explanations for what I believe. You may disagree with my conclusions, but it would be hard to argue that I am simply making things up willy-nilly out of religious delusions or to justify my personal desires. Since my 11 year wants to be a herpetologist (reptile scientist), he decided he needed to get more serious about his science so we’re studying biology right now. We’ve been looking at taxonomy (the classification of living things) and I came up with a fun activity I thought I’d share with you. It’s basically just a worksheet on a wall, but my son enjoyed it. 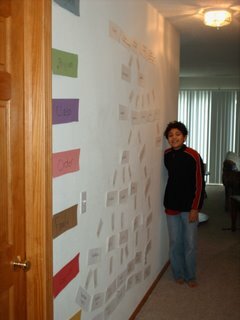 In order to create our “wall of taxonomy” I started by creating a sketch of what the final layout on the wall would be. A taxonomy chart is a lot like a family tree where you start with great great grandma who had three kids who had a couple more kids each who had a couple more kids and so on down the line. The idea is that you start at the top with very broad classifications which split off into more and more narrow classifications. For example, kingdom animalia branches into phylum arthropodia and chordata. Phylum chordata branches into class reptilia, mammilia, amphibia, fishes, and ave. Class mammilia branches into carnivoria and cetecea. And so on until you get down to specific species of animals. I looked at charts like the ones found on this page or this page and mapped out how the classifications start at the top with one broad kingdom which gradually split into more and more narrow classifications all the way down to species. Once I had a map on paper of what the end product would look like, I started making slips of paper with the various names on them. The trick here is that if several animals share the same classification (class mammilia for example), you only made one slip of paper with that name on it. When you make the slips of paper, don’t include the classification, just the name, BTW. So write “mammilia” not “class mammilia” for example. Once all of the names were on their own slip of paper, I made enough arrows to map the splits. Since my son is just starting this, I put the arrows on the wall where they should go to help him out. For example, on our taxonomy wall, Kingdom Animalia split into Phylum Arthropodia and Chordata, so under the spot where the piece of paper saying “animalia” would go, I put two arrows pointing to where arthropodia and chordata should go and so on. Finally we’re ready to go. To start, I had seven slips of colored paper with the seven classifications (kingdom, phylum, class, order, family, genus and species) used in taxonomy and had my boys arrange them in the proper order along the right side of the wall. I also made an additional slip which said “common name” to put at the bottom after “species” and made slips of paper with the common name of animals we were working with along with the names of their phylum, class and such. Then I gave my son the pile of (mixed up) slips of paper I had made with all of the various classification names on them. His job was to place them all in their proper spots. I had him start by spreading the slips out on the floor, picking out the things he knew to put up first and then grouping names which he thought went together. I told him he could use books to help him out, but he really tried to do it without looking for help. In the end, he got it all correct and we snapped the picture above before his little sister started trying to tear the pieces of paper off the wall (taking a picture of a wall in a hallway is pretty tough, BTW). One of the nice things about this activity is you can make it very hard or very easy. If you have a more advanced student, you may not want to put the arrows on the wall for him or her so that they will have to remember what the splits are without the help of hints. Also, you can do as many or as few organisms as you want and can use it to study groups of living organisms and how they are related. I’m afraid my explanation may not be that great and I probably made it sound harder than it was, but the prep time for this activity, including hunting down charts listing classifications which I link to above and cutting up paper (perhaps post-it note would have been a more efficient method!) was probably about an hour and a half. I think I got a pretty good bang for my buck. Anyhow, I just thought I’d share!